HOW ATTINY CAN BE BRICKED? Actually, there are many reasons. But let me explain what I mean by “bricked”. If you’ve powered it with over voltage and fried it, well, it’s not “bricked” then, rather it’s roasted. Arduino and HVP have nothing to do with it. 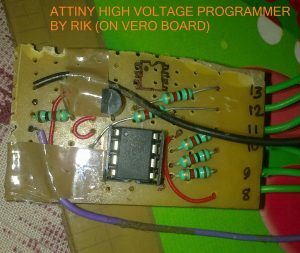 But, if your ATtiny stopped responding due to some wrong fuse settings, then it’s “Bricked” and hopefully we can recover it using Arduino as HVP. So another question is, what is fuse settings? Well, there are 3 bytes of permanent (by permanent I mean that they stick around after power goes out, but that you can change them as many times as you’d like) storage called the fuses. The fuses determine how the chip will act, whether it has a bootloader, what speed and voltage it likes to run at, etc. Note that despite being called ‘fuses’ they are re-settable and don’t have anything to do with protection from overpowering. To learn more about fuses, simply google about AVR fuse. Or you may check this article . 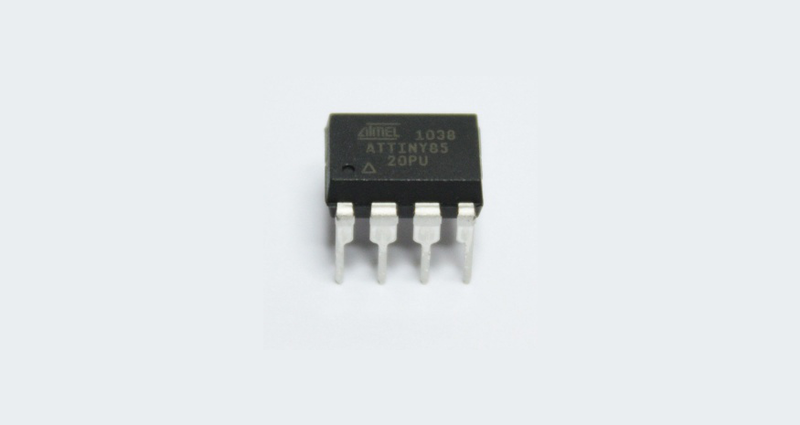 There are various mistakes one can make in fuse settings that result in a bricked ATtiny. Most common of them are Disabling ISP Programming and Selecting Wrong Clock Source. If ISP programming is disabled in fuse settings, ATtiny will not respond to an ISP Programmer. It’s just like, you have a robot that does exactly what you order him and one day you order him “Stop listening to me!”. You know what’ll happen. And if you set fuses that select wrong clock source than you are actually providing, it will stop responding until correct clock source is provided as per fuse settings which you either don’t know or forgot. In these situations we can say ATtiny is “Bricked”. Okay, now we need to learn how we can recover our ATtiny from bricked state. As we’ve already learned, ISP programmer can do nothing anymore until fuses are reset in default mode, hence we need a High Voltage Programmer. If you want to know how a HVP works, google about it. 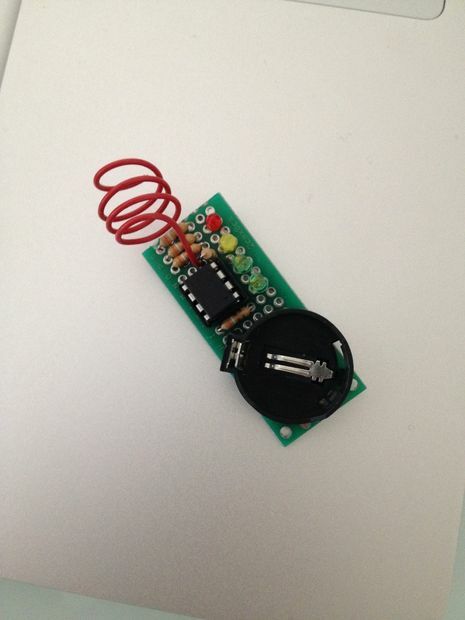 Here we’ll make a High Voltage programmer using Arduino. 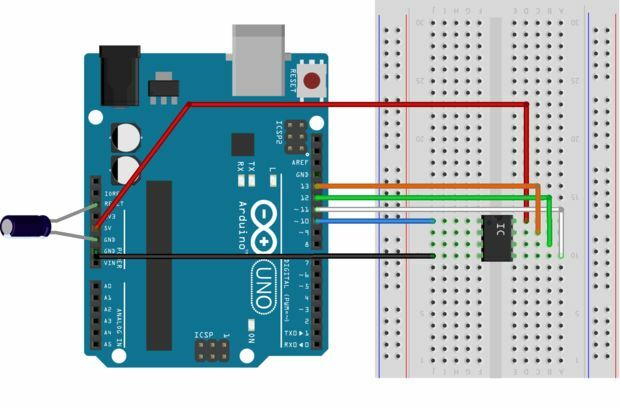 Arduino has more than enough pins to simulate a HVP. A very minimal additional circuitry is required. We’ll make the circuit, plug it in to Arduino, Upload sketch in Arduino and we are good to go. 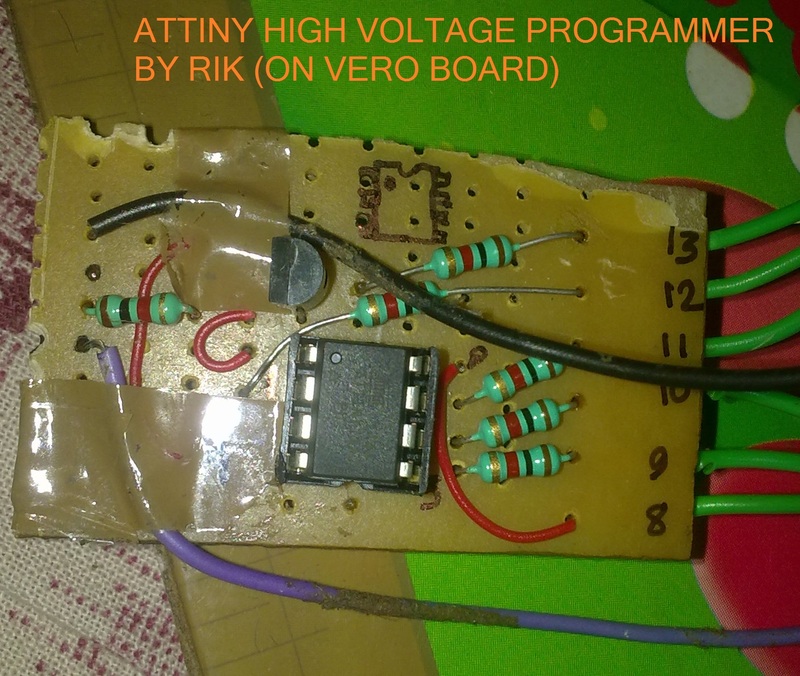 The HVP will reset the fuses of ATtiny to default one. So, the ATtiny will again respond to ISP programmer. Considering you already have Arduino, the cost of rest of the circuitry will be very small. A 12V power supply @ 500mA. If you want to make it on vero board or PCB, use an 8 pin IC base (DIL08) and L shaped male header (7 pins required). Making a permanent board is recommended. Use below pdf files to etch your own PCB on copper clad. There are 2 pdfs in .zip file. Consult both of them to get idea about orientation of components. Print the pdf in MIRROR view to get correct orientation after etching. Below pdf is for colored PCB layout. You may not need it. Use below Gerber files to fabricate PCB. First of all make the circuit either on breadboard or on PCB/veroboard. Now, connect your Arduino to PC and open ArduinoIDE. Select correct COM port. Write or copy-paste the given sketch to IDE and upload it to Arduino. Once uploaded successfully, go to serial monitor and set Baud rate to 19200 and No line ending. Now, connect pins of the circuit you made to respective pins of Arduino. If you have made a PCB with L shape male headers, simply plug it in to Arduino’s D8-D13 (and GND) pins. Well, now you need to type a single character like a, b, x etc. and hit Enter↵ to initiate the process. 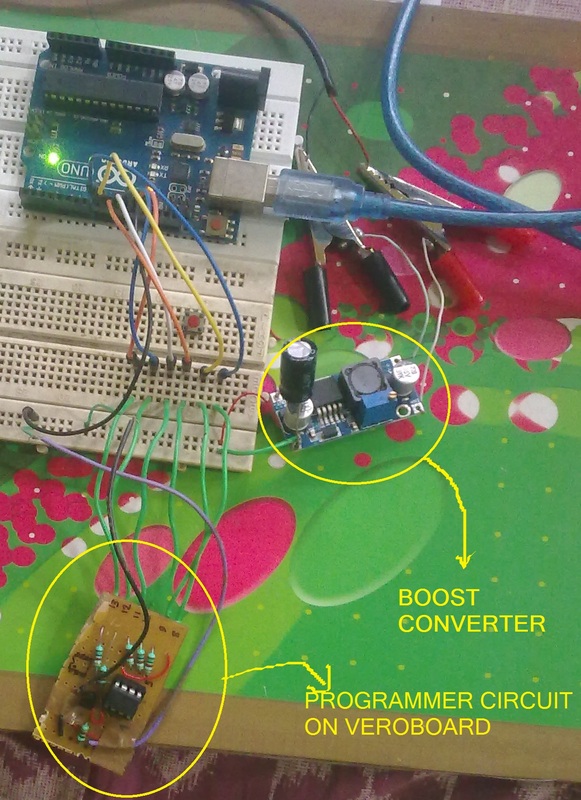 The Arduino code is smart enough to detect your ATtiny model automatically and write correct fuses according to it. You don’t need to specify model or fuse settings. It’ll do all for you. The code can detect 7 different ATtinys. So, after you’ve entered a character you can see the current fuse settings (which bricked the IC) of your ATtiny, and then it will be over-written with correct one, now once again the current fuse setting (which is correct now) is shown. Done. Next, turn off 12V power supply, detach arduino from PC, remove IC from socket and program it using your ISP programmer as you normally do. Hi Aman, please let me know what issue you are having. It should work unless your ATtiny is physically damaged. If the MCU is somehow got fried, you can do nothing. Please elaborate the problem you are facing. “Not working” barely explains anything. Thanks for letting me know, Kaustav. I’m glad it worked.Please keep visiting electronics-lab.com. I setup circuit and uploaded and ran it. The message says that signature is FFFF and initial fuse is FF, FF and FF. Then the second fuse reading is also FF, FF and FF. I triple checked setup and wiring and tried it three times. Still same. 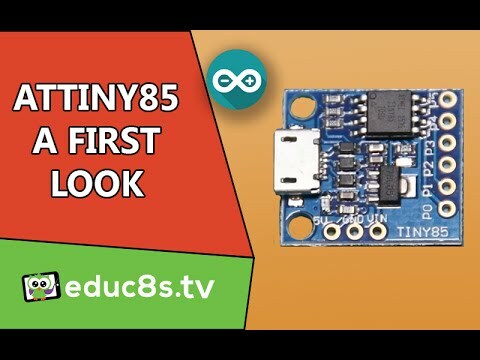 It looks like my attiny85 is fried? I followed the steps and my ATtiny is working again great aid!! Worked great at first try on breadboard! Now to do something more permanent. 🙂 Thanks a lot! Thanks for your feedback, glad it worked! evening, thanks this is brilliant as keep changing the code to 16mhz and bricking the atting85.issue i’m having is printed of the PCB and writtening is backwards but if i flip the image the reset pin is on the worng side. is the one with the written backwards the correct one. Thank you so much! It works perfectly! When I brick a chip, the easy way is to throw it away and get another one. But it is so wasteful because it is still working, just the fuse was deranged. I am so happy that I learned a lot during the process as well. is it necessary to use 12v? can i use 10v instead of 12? Yes, 12Vdc is recommended by Microchip. I need this reset pin as an input, so I have to burn the fuses every time I upload a sketch while I develop and test my app to attiny85. Is there a way around or a programmer that can do both without get ruined. It works flawless, i brick an attiny85 changing to Ext Clock 🙁 , now its alive. Thanks for your feedback on this tutorial. Have a Happy New Year 2019! Thanks for point us to your revision of this HV programmer. There’s a current limit for the 12v power supply? Can I use a PC power supply? Any 12Vdc power supply with at least 500mA capacity will work.